Pssst. Hey Buddy. Wanna buy a bridge? How about a flu shot? Yeah?…thought so sucker. Alright, alright, maybe I’m being a little hard–most people don’t know. They only know what the authorities tell them. Get your annual flu shot. Prevent the flu. Save your life. Isn’t that the mantra? Recent reports show that the distribution of flu shots in the U.S. this year is at 103 million–an all time high. Well, I’ve got some bad news for ya–the flu shot is a scam. No, no–it’s not a conspiracy; your doctor really believes in it. And a couple hundred bucks a shot doesn’t hurt the believing process, either. So how is it a scam? First off, it’s not 100% protection. That is, you can get a flu shot, and…still get the flu. How’s that? 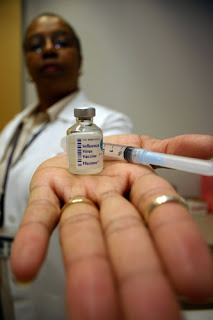 Well, according to the Centers of Disease Control (CDC), “It takes about two weeks after vaccination for antibodies to develop in the body and provide protection against influenza virus infection. In the meantime, you are still at risk for getting the flu (emphasis mine).” Furthermore, you can still get the flu due to the variability in flu strains–that is, the current flu vaccine protects (however questionably) against a particular strain, not all of them (also from the CDC; read here). And your protection also depends on the age and health status of the person getting the vaccine (more on this in a second). Second, the flu virus is one of the most highly mutating organisms there is, so strains change all the time. That’s why you have to get a new shot every year (and don’t forget, a couple hundred bucks a shot also helps with this category). The bottom line is this: you don’t know which flu strain you’ll encounter, and even if it’s “this year’s strain”, you still don’t have total protection. Call me crazy, but…ain’t that the flu? So let me put this into perspective: You go to your doctor every year and pay good money for a vaccine that doesn’t work all that well, only protects you from a small faction of microorganisms that can cause the flu, and which actually causes flu-like symptoms. Uh…can I ask a question? WHY NOT JUST GET THE DAMN FLU?!?! I know, I know, the authorities tell us that it’s for the protection of the elderly, the immunocompromised, and children. However, in the same breath they tell us that the effectiveness of the vaccine is age dependent; and I highly doubt that 20 to 60-year-olds are at the highest risk. All I can say is this: I’ve never had a flu shot; I’ve had the flu plenty of times; I’ve had the runs, fever, and body aches; and I didn’t want to do anything. So I drank lots of water, and I slept a bunch. I got better, and I developed natural immunity–so, ultimately, I got stronger. Hey, listen–if you feel safer with a flu shot, then go ahead. And when you’re ready, I’ve got an excellent multi-level marketing business opportunity for you…and a bridge. If you want to read more on this sham, here is an excellent piece published in the British Medical Journal. And comments to that piece from skeptical MDs in the U.K. (read this because this is from the guys who are administering the shots, so perhaps they have some insights you and I do not have–please scroll down to read the comments).